Extreme ultraviolet (EUV) and soft X-ray (SXR) science has seen revolutionary advances over the past decade. First, small- and large-scale coherent sources, including high harmonic generation (HHG) sources, are under rapid development worldwide. Compared with previous generation sources, these new light sources have remarkable properties. 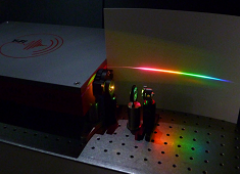 Tabletop HHG sources bring a tunable X-laser to your laboratory, with selectable wavelength from 2 – 47 nm (26 – 700 eV), control over the linewidth from <100meV to a coherent supercontinuum, fully spatially coherent beams, linear and circular polarization, as well as the ability to generate attosecond pulses and pulsetrains that are perfectly synchronized to the driving laser pulses. These unique new capabilities are allowing scientists to make the most precise measurements to date – from capturing intrinsic sub-femtosecond electron dynamics in materials, to implementing the first sub-wavelength EUV/SXR microscopes. Both of these applications were enabled by the KMLabs XUUS – the first engineered commercial HHG source. 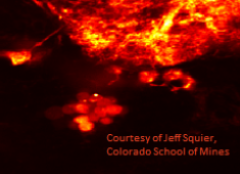 Multi-photon microscopy is a widely deployed tool for rapid, in-vivo, volumetric imaging. For three-photon excitation fluorescence microscopy, the necessarily longer wavelength ultrafast pump pulse increases the image penetration depth. Of particular utility are ultrafast sources in the so-called biological imaging windows at 1300 nm and 1680 nm, where the combination of Mie scattering and water absorption create optimal windows of excitation wavelength for maximal image penetration [Horton2013]. As biological tissue is easily damaged with excessive micro-illumination average power, shorter pulse durations (<200 fs) at a set average power increases the output fluorescent signal light. In “Relativistic electron acceleration by mJ-class kHz lasers normally incident on liquid targets“, by Scott Feister et al., the authors demonstrate a high-repetition rate, high-flux source containing >MeV electrons from a few-mJ, <40fs laser source and a liquid target. The resulting electron flux equals or exceeds that in prior work using lower repetition rate lasers and oblique incidence. The reduced size and complexity of the system compared with laser facilities operating between 0.03-1Hz, along with the high repetition rate of the system, show promise as an alternative to conventional accelerator sources. This work is further enabled by the high pulse contrast and low pedestal of the Red Dragon amplifier system. The Red Dragon system used in this work was in operation from 2006, and recently replaced by our award-winning RAEA amplifier. The Y-Fi OPA MIR output pulse can be used to generate MIR continuum in a fluoride fiber. Coherent broadband light sources in the MIR are useful for a variety of imaging and spectroscopy applications. Having wavelengths across the so-called fingerprint region is useful for gathering chemical-specific information about samples. Such broadband, compressible MIR pulses also find application in time-resolved and nonlinear spectroscopy. The MIR output of the Y-Fi OPA can be used for 2D IR spectroscopy, a nonlinear infrared spectroscopic technique that can measure structural information not available with standard linear spectroscopy. The use of short pulse durations enables high temporal resolution. The tunable OPA output can be used directly from 2300-4300 cm^-1 (4300-2300 nm), or could be used to drive MIR continuum generation, enabling a broader probe bandwidth. Coherent Raman scattering, in all of its various incarnations (CARS, SRS, ISRS, RIKES, etc.) derives species specificity and concentration by probing the molecular structures present in the foci of an appropriately prepared laser(s) without the addition of any external labels. The capacity to generate supercontinuum with high power spectral density in the short-wave infrared via high pulse energy, high repetition rate, and short pulse duration enables the generation of a broad spectrum stokes pulse suitable for multiplexed Raman scattering experiments. The long wavelength of these excitation pulses in the short-wave infrared are ideally situated being in both eye-safe [Rasskakzov2017] and overlapping a biological imaging window for deep tissue penetration. 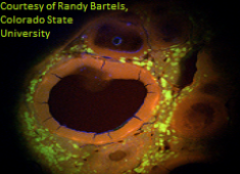 In a collaboration between NIST, JILA-University of Colorado, and KMLabs, Dan Hickstein et al. demonstrated high-harmonic generation up to the 13th harmonic of the Y-Fi OPA output using a chirped, periodically poled lithium niobate (PPLN) waveguide, with conversion efficiency up to 10%. This work resulted in a 315nm source at 1 MHz repetition rate, showing promise as a source for probing the electronic structure of solid-state materials. The emergence of petawatt class laser systems arround the world is motivating more research and design of the multi-layer mirrors used to steer and manipulate these extreme laser beams. These petawatt systems are intrinsically ultra-fast laser systems, so design of these optics needs to optimize both the laser damage properties of the mirrors, as well as their phase response. 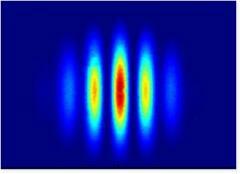 In this work, the Authors design Ta2O5-HfO2/SiO2 composite quarter-wave and non-quarter-wave HfO2/SiO2 BBLD mirrors for a 30fs petawatt laser system. Laser damage of the optics are characterized by scanning electron microscope whereas the phase response (GDD) is characterized with a KM Labs CHROMATIS device. The Ta2O5-HfO2/SiO2 mirrors are found to outperform the HfO2/SiO2 mirrors.